He turned accusingly to the architect, Mark Fischbach. “All my clients are asking for islands,” Mr. Fischbach said, tossing the live grenade back to me…. Americans like things bigger, better, and more! The rest of the world has had our number on that count for years, so no news there, either. So, I’m not quite sure why the recent buzz. However, buzz there is. People have been getting quite heated in their defenses of the kitchen island and the open floor plan and others in their desire to bring back smaller scale and more intimate kitchens. 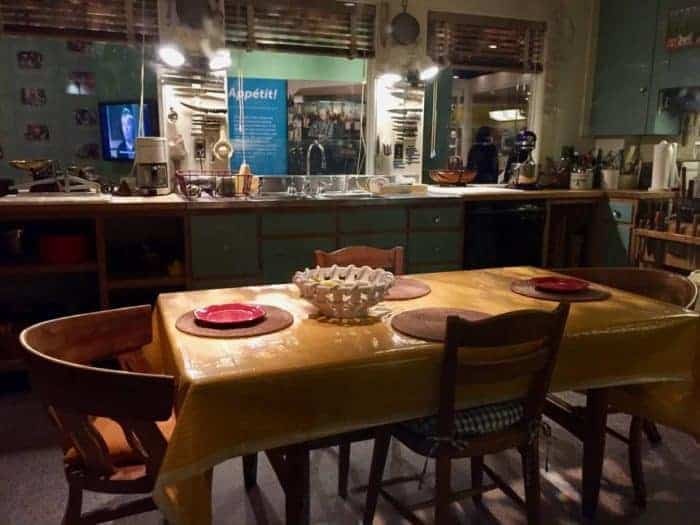 Treehugger , who went so far as to post a picture of Julia Child’s own kitchen in support of his argument, received quite a few very passionate responses to his take on Slattala’s article. Even the millenial DIY duo Young House Love got into the fray with their latest podcast (minutes 9-15, if you don’t care a fig about the rest of what they’re discussing). Kitchen islands grew in popularity during the 1980s as use of formal rooms decreased. People started knocking down walls into the living, family, and dining rooms, often doing away with the formal spaces entirely. Without the wall space for cabinetry, more storage room needed to be created, along with some sort of delineation between the functions of the wide open space. What’s so bad about a pretty dining room that doesn’t need a table cleared of crumbs, crafts, and homework before sitting down to an occasional holiday, more formal, or grown-up-time meal? Others put islands in kitchens that just don’t have the space. Some really cute kitchens. The mint green one above — ahh! — I love it! But why the super, duper narrow island???? Not to mention, there is hardly room to open the stove. Chuck it, and this kitchen is perfect, IMO. Luckily, the island looks moveable. In all of the above kitchen scenarios, I would bang my hips on those narrow little islands and tip them over, along with all their contents. Furthermore — maybe I’m the only one — but I need at least 30″ of depth to feel comfortable chopping carrots. Yes, perimeter counters are only 24″ deep, but there’s a wall at the end of them to keep my carrot tops from flying all over the place. Here’s my thought — if you don’t have room for a 30″ island with 48″ of walking space around it (42″ minimum), you don’t really have room for an island at all. Just enjoy your walking space. And if your kitchen was created with a peninsula, embrace it! Love the space you’re in. Gorgeous kitchens with peninsulas could be a whole other post! I think that if I lived in a house with an open floor plan, I’d need an island. If not, then I’d have to find the best layout for my space — island, peninsula, galley, center table. You have to love the space you’re in. Given my ‘druthers, I like a separate kitchen with a center table. I like cozy. I’m a neo-trad at heart (however much I may get really excited about lots of different architectural and decorating styles) and I think a center table is a timeless classic. 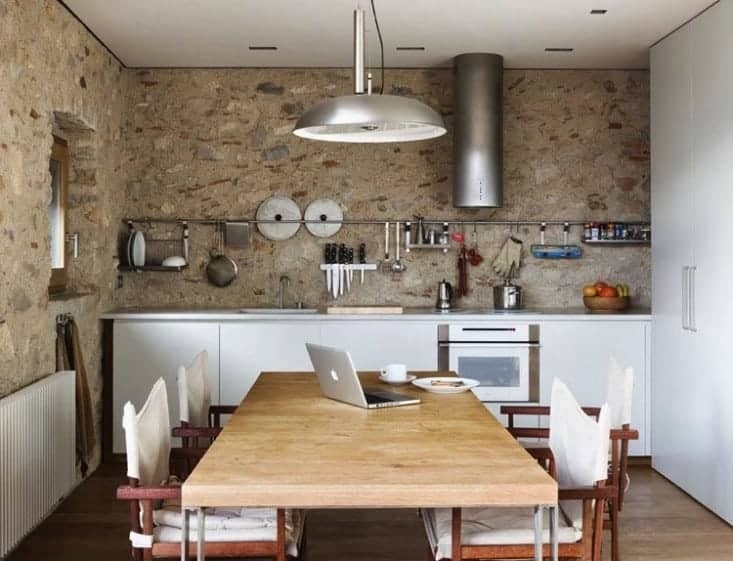 And while a center table may seem very traditional to us Americans, the Europeans — those paragons of minimalism, small-space living, and general detachment from consumerism and accumulation — can show us just how very modern a center kitchen table can be. Here comes a whole bunch more eye candy, ranging from antique, to neo-trad, to modern. Enjoy! Cream & White Kitchens — Happy Accident or Stroke of Genius? Do you have any feelings about the Great Island Debate? Are you in a particular camp, or, like me, are you situationally influenced? 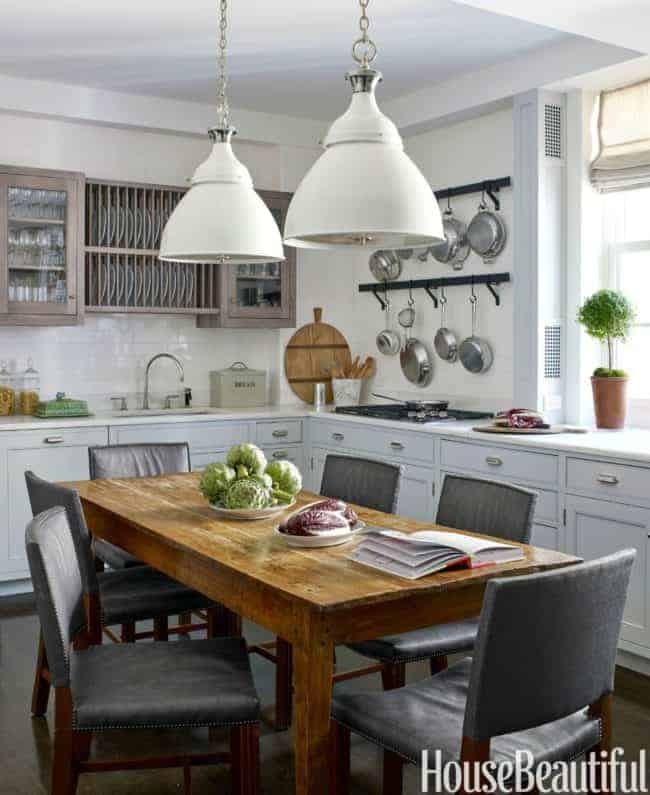 Would you ever consider just having a center table in your kitchen? I promise I’ll try to have that flooring post next week. Summer is killing my blogging time. Hope you understand! Trying to live in the moment with the kiddos as much as possible while they’re still small while still taking care of clients and connecting with all of you. Happy summer Saturday! I LOATHE kitchen islands and am so sick of seeing them everywhere. I would never have one.